This product from Chess Baron: Free Shipping for UK. The Easy PLUS has BONUS and DELAY options over the standard Easy. A virtually unbreakable and ideal chess clock for schools, clubs and home use. Combines simplicity with a sturdy and elegant design. The PLUS has extra bonus and delay options from the standard Easy range. Easy to program and easy to use, the Easy Plus features handy front buttons, game timer count-up option, simple one-touch reset, a large and clear display, low battery indicator and optional buzzer. Individual time settings possible for each player. Easy Plus comes in a nice gift box. Good pricing competes with analogue clocks. And... yes... Batteries Included! 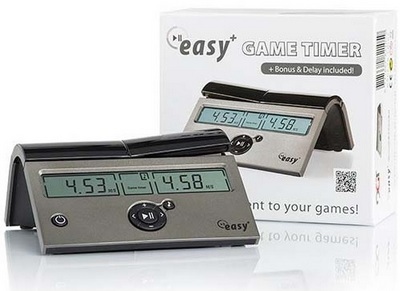 Easy PLUS - Digital Chess Clock with Advanced Features. Batteries Included!